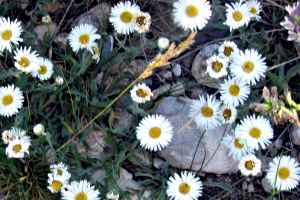 According to this reference work, there are 36 species of Erigeron flourishing here in Montana, from acris and allocutus through lonchophyllus, ochroleucus and peregrinus, right on through to tweedyi (I tot I taw a puddytat!) and ursinus. Lions, tigers and bears, oh my!